Easily the most popular climbing tree stand from Summit, the Viper SD delivers a fresh new way to survey your hunting terrain as you stay high up and safe in the trees. 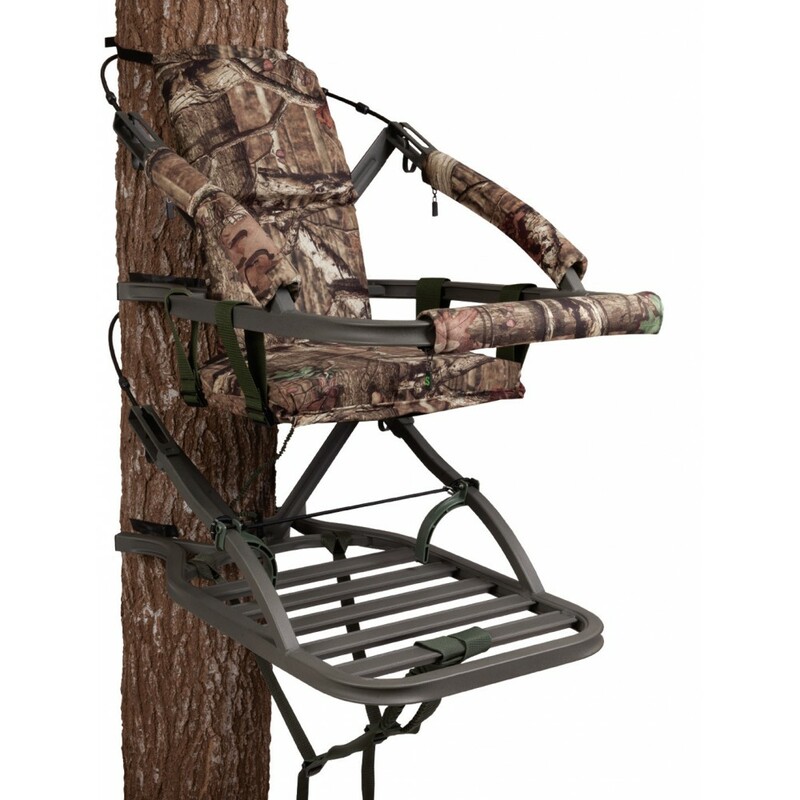 This tree stand is a lot more than just a portable model as it represents an exquisite combination of comfort, roominess, light weight and versatility to ensure that every hunting trip is exciting and productive for the hunting enthusiast. These are the reasons why this tree stand continues to be a favorite for almost two decades and running. Definitely a solid choice for bow and rifle hunting, this model boasts a distinctive Combing Mossy Oak Breakup Infinity camo look that will be difficult for the target to detect. Keeping you concealed high up in the tree, the tree stand boasts quiet engineering so your target won’t sense your presence so easily. When used with the proper hunting apparel, the tree stand keeps you virtually invisible among the tree limbs and branches so you can take aim and shoot without being detected. This unit comes with the legendary DeadMetal Sound deadening SD technology that ensures reduced noise thanks to the critical parts of the platform being filled in with specialty foam that expands so unintentional noises get dampened when you move on the platform. In addition, the QuickDraw® Cable retention system exclusive to Summit ensures a fast and quiet cable attachment system that is simple to maximize. Once you get the suitable cable sizing for the diameter of the tree trunk, just insert the cable into the suspension arm bracket then pull the trigger to lock the cable firmly into place. This eliminates the need to fumble with tricky nuts and bolts or knobs and pins, ensuring a secure yet silent attachment system. Equipped with an aluminum 5-channel platform frame, this tree stand ensures adequate support for you. It comes with the Summit Lokt® precision welding, which utilizes premium quality extruded aluminum plus exclusive precision welds to deliver high rating strength and superior toughness. With every joint virtually locked in place prior to the welding process, the tree stand joints ensure minimal stress delivery to them. This means you have a strong, secure and safe tree stand built to be deadly quiet. What’s more, the ergonomically shaped RapidClimb® Climbing Stirrups are made adjustable so they can accommodate any size boot. The tree stand is designed to last for many hunting seasons and even ships to you with a dependable five-year limited warranty as your assurance of total quality and craftsmanship. The four-point safety harness enables safe, problem-free and effortless ascent and descent. 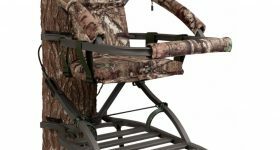 The backrest adds to the comfort provided by the foam seat, so you can settle easily into your hunting stance and have a comfortable time waiting for your deer. This tree stand comes with everything you need so you won’t have to make additional purchases. Lightweight at only 20 pounds, this model can easily be carried to and from your hunting grounds. It comes with: an aluminum seat/climber frame; two coated steel climbing cables; a four-point Fall Arrest System (FAS) or harness with attached SRS strap and safety strap; RapidClimb Stirrups to hold your boots securely as you climb; three 16-inch zippered arm pads so you can comfortably rest your arms while waiting for your target; camo backpack straps for easy carrying to and from the site; a green utility strap by which you can bring your hunting weapon from the ground to the tree stand; a stand umbilical rope to keep the unit strapped to the tree. The included written instructions simplify setup and usage of the unit. You can always refer to those instructions should any issues arise during use of the tree stand. This model also comes with a safety and instructional DVD so you can be fully guided in the optimal use of the product. This tree stand is ideal for trees with trunk diameters of 8 to 20 inches, allowing you to select a healthy and capable tree on which to mount the unit.